The confluence of Muddy Creek and Mill Creek creates Snow Lake just outside of Johnsonville. The landing at Snow Lake, pictured here, is a popular fishing spot. 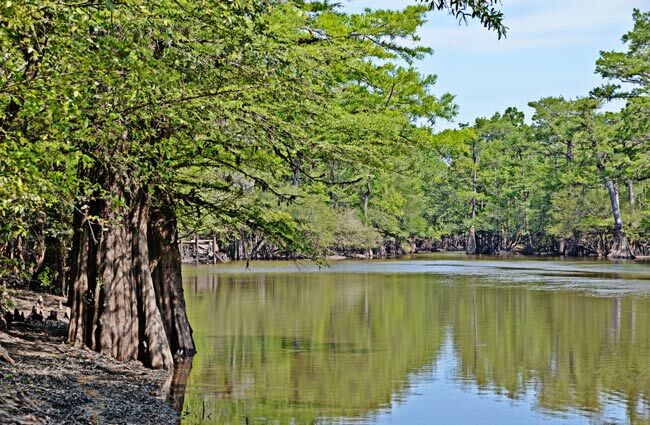 Just beyond the cypress trees that line the banks of the lake sits Snow’s Island, which served as the base camp for General Francis Marion for four months during the Revolutionary War. From December of 1780 through March of 1781, Marion and Colonel “Light Horse” Harry Lee set up camp on the swampy terrain, which lent to Marion’s widely-used moniker, the Swamp Fox. The militia leaders believed that the island, surrounded by the Great Pee Dee and Lynches rivers, would isolate them against British attacks. However, in March of 1781, the camp was compromised when British Colonel Doyle raided the island. Marion never again utilized Snow’s Island. Significant as a Revolutionary War campsite, Snow’s Island served as headquarters, supply depot, and retreat for General Francis Marion’s partisan forces during the crucial winter of 1780-81. Snow’s Island is the most famous of wilderness retreats of General Marion, the man whose hit-and-run tactics and crafty elusiveness earned him the nickname “Swamp Fox.” General Marion was one of three partisan generals who helped turn the tide against the British in the South. The ideal location of Snow’s Island afforded the launching of numerous harassment and interception raids on British outposts as well as a major assault upon the Georgetown garrison conducted by the combined forces of General Marion and Colonel “Light Horse” Harry Lee on January 25, 1781. Despite extensive measures taken by Marion to insulate the island from enemy attack, continued tactical successes of the partisan forces convinced the British command that destruction of the camp was essential. In late March of 1781, while Marion repelled and pursued one British attack force, another under Colonel Doyle penetrated to Snow’s Island and destroyed the camp. Marion never used Snow’s Island again after Doyle’s raid.